Welcome to 1-888-TYPE-IT-UP! We are proud to provide one of the leading and most trusted transcription services tailored for virtually any company or individual with audio or video to transcribe. Handmade in the U.S.A., 1-888-TYPE-IT-UP transcripts deliver the quality and accuracy that businesses and consumers love. If you are in need of transcription services, 1-888-TYPE-IT-UP can bring your words together so you can bring your ideas to life. With 24/7 live chat and phone support, you can rest assured with quick response times that help you start projects and obtain quotes instantly. Unlike other transcription companies that outsource their work overseas and/or impose slave-labor transcription wages, 1-888-TYPE-IT-UP commits itself to 100% U.S.-based transcription that guarantees far greater accuracy and security as well as a healthier economy. Our standard turnaround delivers your transcripts on fair, timely terms with the deadline you specify rather than basing your turnaround on individual recording length, and we are the only transcription company that offers three different price points that allow you to control your costs based on the transcription quality you need. Fast, accurate and reliable service makes transcribing with 1-888-TYPE-IT-UP the obvious choice. If you're looking to bring your words together in another form, we also offer closed captioning services, copywriting services, SEO services, PPC management services, note-taking services, editing services and proofreading services. Let us help you capture your message today so you can capture your target audience tomorrow. 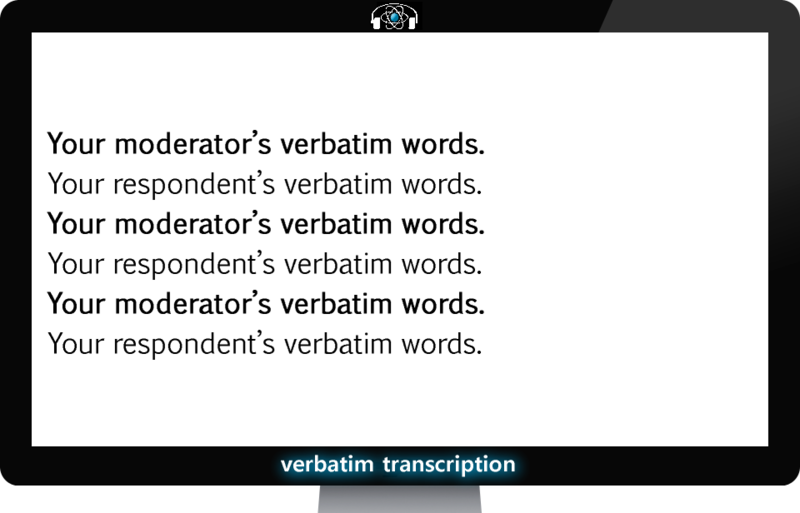 Clean Verbatim - Clean verbatim serves as our default format, as it provides the most practical form of transcripts. With clean verbatim we omit all uhs, ums, mm-hmms, stutters, doubled words, and non-verbal communication such as laughter, pauses and background noises. With clean verbatim you'll receive a superior product without the clutter, and you can rest assured we will not make any omission that will alter sentence or conversation structure. True Verbatim - True verbatim is not as popular as our clean verbatim capture, but we do offer it for those clients who truly want absolutely everything transcribed. With true verbatim we capture all spoken words from a recorded event, including all uhs, ums, mm-hmms, stutters, doubled words and non-verbal communication such as laughter, pauses and background noises. Our edited-summarized transcription service offers concise, easy-to-read transcripts practical for focus group recordings. With edited-summarized transcription we recognize that in focus groups, respondents' words are most important, and moderators' words are secondary. To this end we edit and summarize the moderator's words as much as possible. We do not edit the respondents' words, but we do group their responses together to produce a document with comprehensive, clear answers to the moderator's questions. As an add-on to any transcription order, we offer tracking and identification of speakers to enhance transcripts involving sessions with three or more speakers. We offer speaker tracking for both verbatim transcription and edited-summarized transcription. Budget Notes allow our customers to capture paraphrased summaries of both live and pre-recorded events, altogether providing the most efficient and affordable information service possible. Our Budget Notes can paraphrase any live or pre-recorded audio or video, and we format our notes just like we do our transcripts. This means you can still take advantage of all the features of transcripts, including timestamps/time code, speaker tracking, and more. Budget Notes are great for internal needs, such as logging footage, video editing, real-time note taking, and more. We offer two options for note taking -- live notes and post-production notes. Live notes are available live in real-time during your sessions, making your notes available immediately upon interview or meeting completion. If you choose live notes, let us know the method of your interviews (conference call, live video stream, etc.) when you place your order. Our professional notetakers can then join the conference calls or watch the live video streams of your sessions and take notes live in real-time. Of course, you can also choose post-production notes, for which our notetakers will simply use recorded audio files for note-taking purposes just like we do with transcription. Our quick-response support helps you start projects and solve problems quickly. Everyone on our management team is an experienced editor and transcriptionist. We are always ready to start your next project with 100+ transcriptionists on staff seven days a week. All of our managers and support staff are 100% U.S. based, and we're one of the only transcription companies in the world with 100% U.S.-based transcriptionists, note takers, audio auditors, quality assurance specialists, editors, proofreaders and copywriters. Unfortunately, most writing and transcription companies have found they can significantly increase their profit margins by outsourcing their work overseas. By keeping our work in the U.S., we may not make as much as other transcription companies that offshore their work. However, we are helping to create steady work for U.S. citizens, and in turn we provide a superior product that never compromises on quality. If you’re currently using a different transcription provider that claims not to outsource its work overseas, you should make sure you haven't been misled. Unfortunately, many transcription companies will tell you they have U.S.-based and/or native-English transcriptionists, but in reality, they only contract a negligible number of U.S. transcriptionists while offshoring the majority of their transcription work. Why and how does this happen? Sadly, almost all transcription companies only pay their transcriptionists $2 to $5 per work hour, as they offer the same wage to both U.S. and non-U.S. transcriptionists. This inevitably results in the majority of your transcription work finding its way offshore. With many companies contracting transcriptionists in India and the Philippines, your transcripts are at risk for security breaches and huge transcription inaccuracies while our local economy continues to suffer despite transcription being one service that requires mastery of the English language. We aim to reduce public support for transcription companies who run their entire business with slave labor wages that effectively tear down the transcription industry and our local economy. If you wouldn't pay one of your own employees or independent contractors $2 to $5 per work hour, we don't believe you'd expect your transcription vendor to do so either. If you have questions about this or find yourself tempted to choose another transcription company with lower prices, we encourage you to give us a call. We are always happy to find a way to keep your transcription work onshore. Transcripts aren't gadgets; you can't afford to transcribe with non-native speakers unfamiliar with American culture and colloquialism, both of which are incredibly necessary for accurate transcription of the spoken word and recorded conversation.